Norway’s Jorn Lande returns in June 2017 with a new band and his 9th original studio album, “Life On Death Road”. Claimed to be the biggest selling Norwegian musical export since the pop band A-Ha, Jorn’s catalogue is getting too long to include here but my favourites include Millenium and Masterplan. 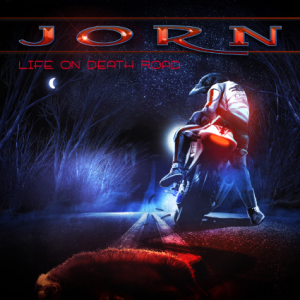 For “Life On Death Road” Jorn is joined by bassist Mat Sinner (Primal Fear, Sinner, Kiske/Somerville), a musician that virtually any fan of European heavy metal fanatic will be familiar with. On keyboards and production is Alessandro Del Vecchio (Hardline, Revolution Saints), who had also joined Jorn for the recording of his last covers album, “Heavy Rock Radio” and was the glue that helped Jorn to create the feel and the direction for the new album. Francesco Iovino (Primal Fear) is on drums and Alex Beyrodt (Primal Fear, Voodoo Circle) is on guitar. The result? This is an album with a lot of talent behind it, and it shows throughout, in the albums songwriting, production, and the bands performance. My personal favourites here are “Fire To The Sun”, “Insoluble Maze”, “Love Is The Remedy” and “The Slippery Slope”, all of which manage to be catchy while maintaining the heavy pace which is the hallmark of this album. Musically, Mat Sinner and Francesco Iovino lay down a fast, heavy rhythm throughout, while Alex Beyrodt riffs with the same ferocity that gained him his position in both Primal Fear and Sinner. But the star of the album is definitely Jorn Lande, one of the strongest singers in rock music today. and this album shows just why he is such an in demand vocalist. Powerful, soulful, and heavy, he is on top form on “Life On Death Road”. Verdict: 9/10. One of the strongest, and heaviest, albums I’ve heard this year.